Buried treasure, hidden caves, and entire cities…we’ve found it all! 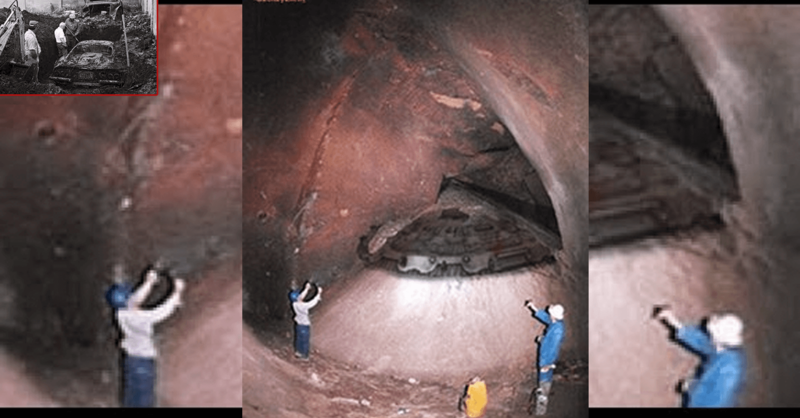 Here are the strangest underground discoveries! A couple in Northern California was walking their dog on their property when the dog seemed to notice something peculiar underneath a tree. In 1978, Gary Johnson from California noticed that there was a large rock sticking out of the ground that seemed a little too unusual. When he called in an expert to evaluate the rock, he was informed that there was nothing noteworthy about it. In May of 2013, a 39 year old from Czech Republic wanted to dig out some tree stumps from his backyard when he noticed some strange objects under the roots. A Californian man had nothing but a metal detector and a shovel when he unearthed something worth 460,000 dollars. The unnamed Californian man dug up a lump of gold that weighed 8.2 pounds. Two kids were playing around in their own backyard back in 1978 when they accidentally dug up something very strange. What they found was a Dino 246 GTS Ferrari. After authorities unburied the car, they realized that it was actually a car that had been stolen several years ago. During the Gold Rush of the 1850’s, thousands of ships sailed in and out of San Francisco, harbouring adventurers in search of their fortune. Now, thousands of commuters walk over these ships every day without knowing. A Chinese worker named Li Zhiwei was hanging laundry to dry his backyard when he noticed what he thought was a snake. In fact, it was actually an earthworm that was a half meter or 20 inches long. An earthworm’s size is dependent on its environment, which is why this particular one had grown so big. When Vincent Marcello from New Orleans decided to dig a plot in his backyard for a swimming pool, he discovered that someone else had already dug a hole for him – over 200 years ago. Marcello discovered an 18th century cemetery that contained 13 caskets with human remains. This half-underground half-underwater cave system is home to a very strange creature. The Waitomo Glowworm Caves on New Zealand’s North Island was first discovered by the Maori people and then extensively explored and documented by an Englishman named Fred Mace in 1887.